Tethers connecting satellites or space stations have some interesting effects even if they are not conductive (see Electrodynamic Tethers: Clean Up Debris - Power or Boost Spacecraft). A non-conductive tether made of a very strong, light material like Kevlar can be used to connect two objects in orbit, one farther away from the Earth than the other. 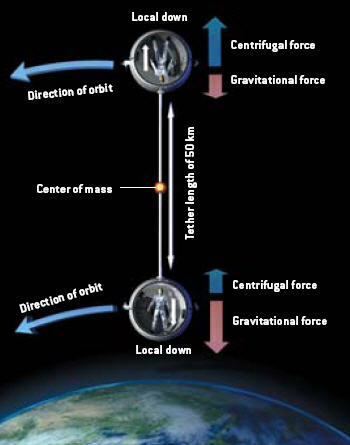 Two forces act on any object in stable orbit; an outward-pulling centrifugal force balanced by a downward gravitational force. Connecting two satellites in different orbits will cause them to act as one system. The outer satellite will experience a weaker gravitational force and a stronger centrifugal force; a net force pushes the satellite outward. The opposite set of conditions prevails on the lower satellite. The lower satellite orbits faster, and tows the other along like a water skier. The system reaches equilibrium when the tether aligns in the radial direction towards Earth. The effect is rather small; a fifty kilometer tether would produce about one percent of Earth's gravity. However, it may be that this very small acceleration could reduce the problems with constant free fall, which is a constant irritant on space missions. Liquids would tend to settle (slowly), and everyone would know where "up" was. I went ahead and purchased online access for a year of SA as well as access to their archives. That material looks great on my laptop! (Hopefully this unsolicited testimonial will make them happier about the one purloined image shown above.) Science fiction writers have also been interested in the idea of generating microgravity environments in orbit. Science fiction author David Brin has made a good story (from 1982) available; you might want to go read Tank Farm Dynamo. This story gives you a good idea of what it might be like to live in this environment. The story takes maybe fifteen minutes to read. '... Ancient weapons are no match for a good blaster at your side, kid.' - George Lucas, 1977. '...a tiny, rocket-powered projectile, drove towards the mysterious bulk. It hit, exploding into a cloud of incandescent vapour.' - EC Tubb, 1958. 'This obelisk is one huge deflector mechanism...' - Gene Roddenberry, 1968. 'We must dig down, and then doubtless we shall find the metal.' - Garrett P. Serviss, 1898.